This is the new West Ham United Away Football Shirt 2018 2019. The Hammers enter the season with new manager Manuel Pellegrini, a Premier League winner with Manchester City. The away jersey is dark teal with claret accents. An Umbro double diamond pattern is on the cuffs. “IRONS” is printed on the upper back. 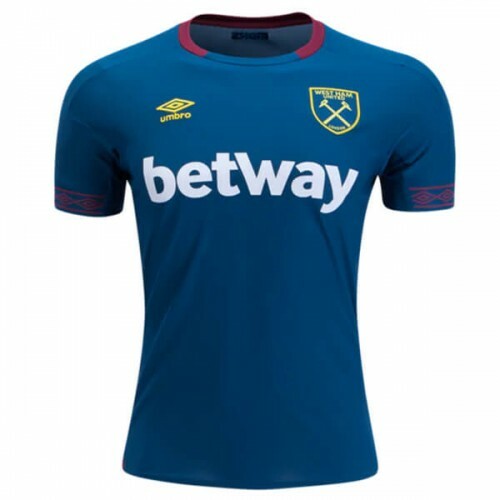 SoccerLord provides this Cheap West Ham United Away Football Shirt also known as the Cheap West Ham United Home Soccer Jersey with the option to customise your football kit with the name and number of your favourite player including Jack Wilshere or even your own name.